Ever since me, Jen, and Gel met up one time at Trinoma and hanged out at SM North City Edsa, I wondered if we could meet up with other bloggers as well besides the usual "events" where we would bump into each other. So through the powers of twitter and texting, we were able to invite bloggers who would like to meet up with us here at Trinoma. Around almost 8-9 of us met up yesterday and had some fun bonding time and retail therapy (for some!) on the side. Sweethestia had to leave early so we had this first quick photo op muna. Love our group photo here! I had a buy 1 take 1 CBTL coupon for a Frozen Swirl and Gie was game to share it with me. We totally forgot to take pics (particularly me coz I was too absorbed in enjoying my Hazelnut frozen swirl!) but I had a lot of fun talking with Gie. She was pretty and sweet! I was happy to learn and know more about her through this event. I hope we do get to meet up again soon. After a few fun photos, we had our mini exchange gift. The gift that I got was from Eenah from BeautyLilSecrets. It was a pair of tassel earrings made by Miss Genn D. And yes, that's the purple earrings that I'm wearing at the photo above. Eenah showing her gift! TY DEAR! I was super happy that I got it! Then it was my turn to give and the name that I drew out (we drew lots by the way to know who will receive our gift) and Miss Genn (aka Mis Tugz! LOL!) from missgennd.blogspot.com received my gift which was a set of SkinWhite Products. Others got awesome gifts as well and we really had fun! Even though our table was really small and we barely were able to be seated properly in our small corner at CBTL, we all enjoyed each other's company. Getting to know one another, exchanging ideas and opinions about certain products, and whatever we could talk about under the sun was such a refreshing experience. Reading each other's blogs and actually meeting the person behind the blog is a whole different experience. And I'm pretty much sure everyone agreed that it was something that we wanted to occur again. Group Photo taken by Manong Guard of CBTL. Then Eenah and Gie had to go home early and we had to bid goodbye to them. But the night wasn't even here yet and some of the other bloggers had a shopping expedition to fulfill. So off we went to Landmark Department Store and we were all distracted at first by the Accessories Selection at the 2nd Floor. Then down we went to the beauty and personal care section where most of the bloggers bought their stuff. I was nearly tempted to buy a dotting tool for nail art but I stopped myself coz I still haven't even used the nail art brush that I just bought from there the other week. I swore to myself that I WILL NOT PURCHASE ANYTHING. Did I keep my promise? Kind of. Will share about that for some other time and at a different post. Anyway last stop was at the makeup section where still some were able to make purchases.. I'm sure Aya and Gel have a lot to say on their blogs about their recent haul there. So watch out for that. Ended the day by having dinner at the Food Court with Genn, Aya, Sofi and Jen. 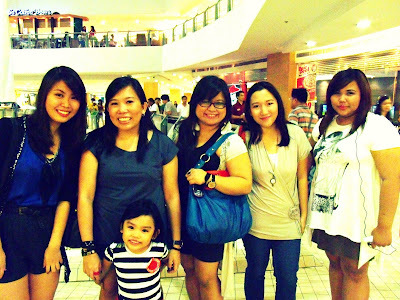 Aya, Rache, Me, Jen, Gel, and Genn at Landmark! I truly enjoyed meeting up with you dears and I hope we can do this again soon! If you wanna meet up with us, check out my post about the Phil-Cosmetics Expo. We will be there on Saturday afternoon. So Coffeeholics, how did you spend your extended weekend holiday? Let me know your thoughts and do comment below. Next post = outfit post that day.